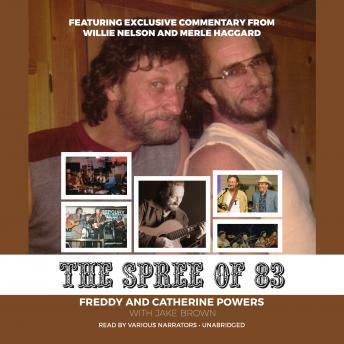 The Los Angeles Times affectionately referred to Freddy Powers as the 'Ol Blue Eyes' of Country Music,' and wrote that if you were to "ask country superstars Willie Nelson, George Jones or Merle Haggard (they'll)...tell you that he's one of country music's best-kept secrets." The Texas Country Music Hall of Fame inductee has been to the top of the charts as both a producer for Willie Nelson's Grammy-winning LP Over the Rainbow, and as a songwriter for many of country music legend Merle Haggard's number one hits. Now, for the first time, Freddy recounts the entertaining and emotional stories behind his decades-long roller coaster ride through the music business; his voyage to the top of the charts, and his inspiring battle against Parkinson's disease. Helping Freddy tell his story are exclusive interviews from fellow country music legends Willie Nelson, Merle Haggard, John Rich, Tanya Tucker, The Voice finalist and Powers' protégé Mary Sarah, along with a host of other Nashville luminaries.